The Premier League’s game of musical chairs for a spot in the top four, the only remaining bit of intrigue coming into today’s league-ending round of matches, only gave us about 45 minutes of real drama. It was a good 45 minutes, though, and for the first time in forever, the music has stopped and Arsenal are left without a seat. For those of us interested above all in maximum drama, today’s simultaneously played matches began almost perfectly. 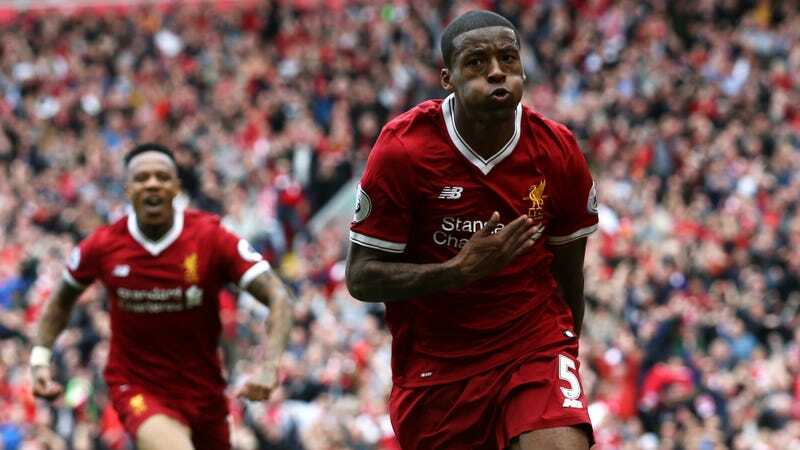 Manchester City, Liverpool, and Arsenal all had realistic shots to cement a place in third or fourth in the table, and for a while it looked like it might take until the very last minute for the final picture to become clear. City had the easiest route to the Champions League places, and they made quick work of things. They got the pressure-releasing opening goal just five minutes in, and scored three more in the first half of what wound up an effortless 5-0 victory. That put the pressure on Liverpool, since an Arsenal win and a Liverpool draw would’ve seen the Gunners jump the Reds for fourth place. Further raising the tension, Arsenal’s Laurent Koscielny got sent off about five minutes later. With that card, Arsène Wenger’s men would need to hold off Everton for more than 75 minutes with ten men while also hoping Liverpool didn’t beat Middlesbrough in order for Arsenal to finish in the top four for the 21st season in a row. But soon after that, Alexis Sánchez doubled Arsenal’s lead in the 27th minute, giving them a solid cushion for fouth as long as Liverpool continued cooperating by failing to win. So that’s it! City finish the season in third, Liverpool fourth, and Arsenal fifth. We already knew coming into the day that Chelsea were Champions and that Hull, Middlesbrough, and Sunderland were relegated, so the Champions League spots were the only things of any importance yet to be decided. Today wraps up a good season that kind of petered out by the end, and the action today was a good mirror of that. And while the EPL season might be over, the Mercilessly Teasing Arsenal Fans For Falling Out Of The Top Four season has just begun. So in a way, we all won today.